Supporters from each party exchanged some light-hearted banter earlier today. Amid the general confusion about who to vote for in the upcoming elections, confused South African voters have managed to maintain their unrivalled sense of humour. Popular Twitter user and ANC supporter Zinhle Khumalo (@zinhlemakhumalo) shared her sentiments on a recent move made by President Cyril Ramaphosa before being advised by one of her followers to save herself some trouble by voting for the EFF. Khumalo did not take too kindly to the suggestion and she jokingly labelled the party “Boko Haram Interns” following recent reports on the increasingly militant behaviour of the party’s supporters. The conversation then spiralled into a war amongst supporters for each party. 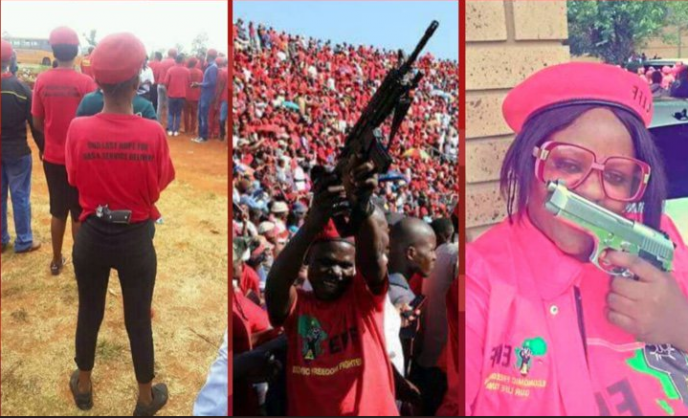 One EFF supporter shared an image of Umkonto weSizwe veterans in response and likened them to the infamous terrorist organization, Al Shabaab. Though Khumalo opted not to keep the twar going, her clapback has been doing the rounds, even catching the attention of Malusi Gigaba’s former spokesperson, Mayihlome Tshwete. Bare EFF Ke Boko Haram interns ???????????????????????????????? Please note that voting stations will open from 8am-5pm this weekend (January 26-27) to allow first-time voters to register and registered voters to check and update their registration details, even if they do not yet know who they are voting for. It is all systems “Go!” for the final #RegWeekend this Sat & Sun 26-27 Jan. SA’s 22 925 voting stations will open from 8am-5pm to allow first-time voters to register, & registered voters to check & update their registration details. Full statement at https://t.co/VFn0VO2vM5.